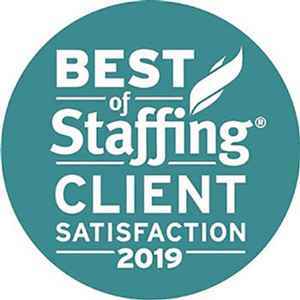 The Medicus Firm, a leading physician and advanced practitioner placement firm, announced today that it has won ClearlyRated's Best of Staffing® Client Award for the 7th time in 9 years for providing superior service to its clients. Presented in partnership with CareerBuilder, ClearlyRated’s Best of Staffing Client winners have proven to be industry leaders in service quality based entirely on ratings provided by their clients. On average, clients of winning companies are 2.2 times more likely to be completely satisfied with the services provided compared to those working with non-winning agencies. Focused on helping hospitals, physician groups and other healthcare employers find the right providers for their job openings, on a scale of 0-10, The Medicus Firm received satisfaction scores of 9 or 10 from 72.4% of their clients, more than double the industry’s average of 35%. Less than 2% of all staffing agencies in the U.S. and Canada have earned the Best of Staffing Award for service excellence. “From our newest team members to our most tenured and in every department in our company, we are hyper-focused on client satisfaction. We are very proud of our results and are pleased that our efforts are recognized and appreciated by our clients. With our 7th Best of Staffing win, it is safe to say that we are humbled and that we’ve been blessed with great teammates doing great work on behalf of great clients,” The Medicus Firm’s President, Jim Stone said. Since 2001, The Medicus Firm has been committed to be the provider recruitment firm of choice for hospitals, physician groups and healthcare employers nationwide. TMF offers its clients industry-leading models of candidate sourcing, strategic process improvement and physician staffing management. The Medicus Firm is a part of the M3 USA group of companies and is a proud MGMA Executive Partner.